63 1933 W.C.T.U. met May 16 at the home of Mrs G.D. Alden. Mrs German had charge of the Devotionals. She chose the topic of "Mothers place in the home." Song "Crusade Hymn" "Mother's Day" a song by Mrs Mitchell. Scripture John 19:25. Prayer offered by Mrs Hess. Miss Butler then introduced our guest speaker; Mrs Mattie Pemberton of LeGrand. Secretary's report read and approved. Treas. being absent there was no report. Mrs Hess announced meeting of Flower committee for June 9th. Flowers will be made ready for distribution. Miss Park reported on Peace Essay contest for school children, "War and Waste". Mrs Robt Lincoln announced C.Convention to be held in Malcom June 15th. Delegates appointed were Miss Butler, Miss Park and Mrs Lincoln. 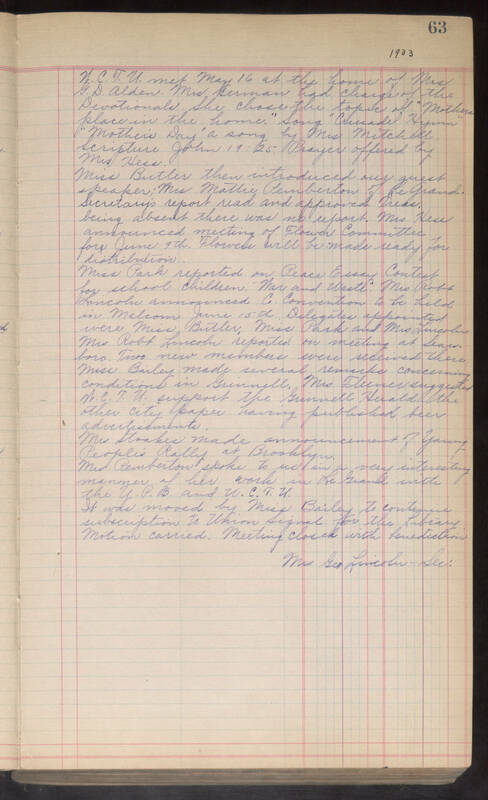 Mrs Robt Lincoln reported on meeting at Searsboro. Two new members were received there. Miss Bailey made several remarks concerning conditions in Grinnell. Mrs Fluner suggested W.C.T.U. support the Grinnell Herald the other city paper having published beer advertisements. Mrs Stoakes made announcement of Young People's Rally at Brooklyn. Mrs Pemberton spoke to us in a very interesting manner of her work in LeGrand with the Y.P.B. and W.C.T.U. It was moved by Miss Bailey to continue subscription to Union Signal for the Library. Motion carried. Meeting closed with Benediction. Mrs Geo Lincoln--Sec.